I tried downloading Civilization V just the other day when I learned that it is available on Steam for Linux, but I haven't been able to get it to work and haven't gotten around to contacting Steam for help yet. Anyone know if you can play a PC game from Japan on a British PC please ? Assuming that by PC you mean they were both designed for Windows, and that you have a current enough version of Windows running, it shouldn't be an issue (so long as you can speak Japanese or the game has multiple language settings, though this is uncommon in Japan). If you have a physical copy, like a cd/dvd/blueray, though, I guess it could have some regional protection thing on it. But you'll find out when you try it, I guess. I don't think PC games are region-locked the way that DVDs and Blu-rays are. Right now I'm just re-watching the early stuff for that reason too. I like how often it's joked that Halo are Microsoft are some sort of religion for Chief. Even though this is played for laughs here, it does sort of comeback in a weird way when Arbiter realizes that's all his life consists of and that he's lonely, stuck with Chief. Fortunately he gets some other friends for a while. 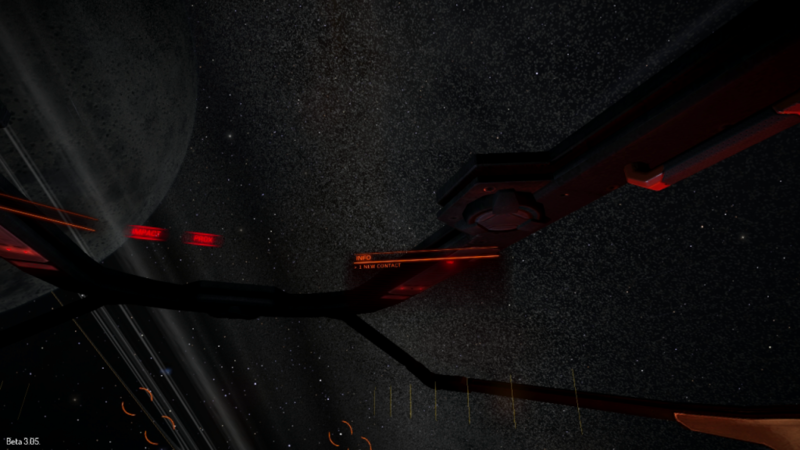 And the exact same game as it appears in AndyJ's most recent build with textures by nanite200. I cant recommend getting hold of this enough, one of the greatest games ever coded, now even better. In celebration of AndJ and Nanites latest build of Frontier I made this vid. Link to the Frontier forums and all the info you need to download and install this remarkable game are in the vid description. 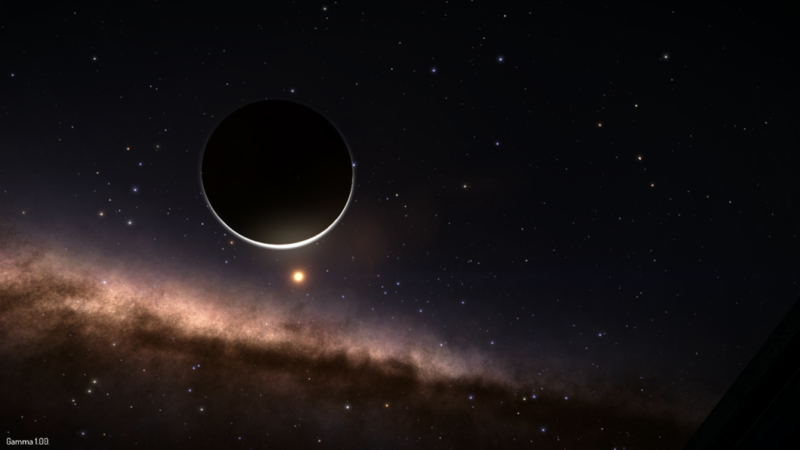 Go see the galaxy! 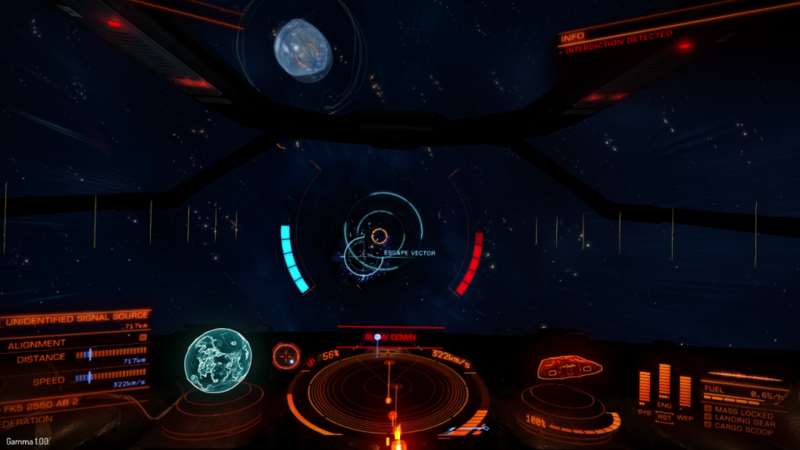 Making of Elite Dangerous (and some good stuff about how much science has influenced things). Take note EA this how a modern games company should be. Backed by its players who have active feedback in its design stages, developed by a team of enthusiasts with creative input working for an enthusiast and released to their schedule without pressure to publish a half finished game full of holes and bugs. I stumbled into a war zone! 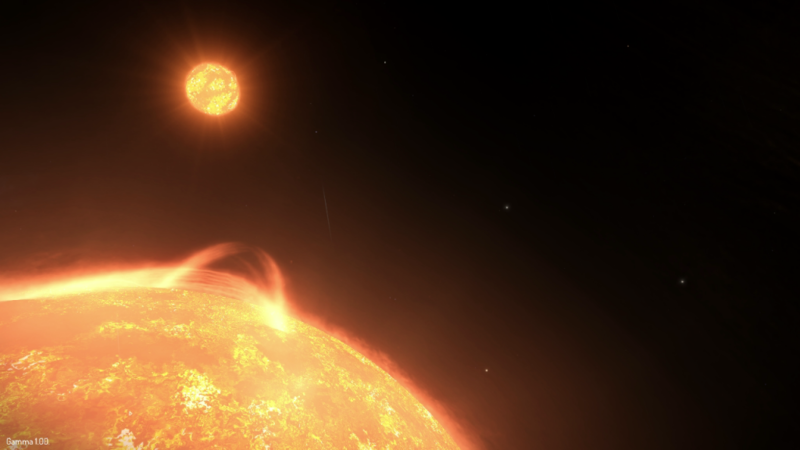 ps a lot of the footage in this is time-lapsed- if you want to watch a solar flare in game its all in real time, so can take a while to witness a whole eruption, like watching a lava lamp! 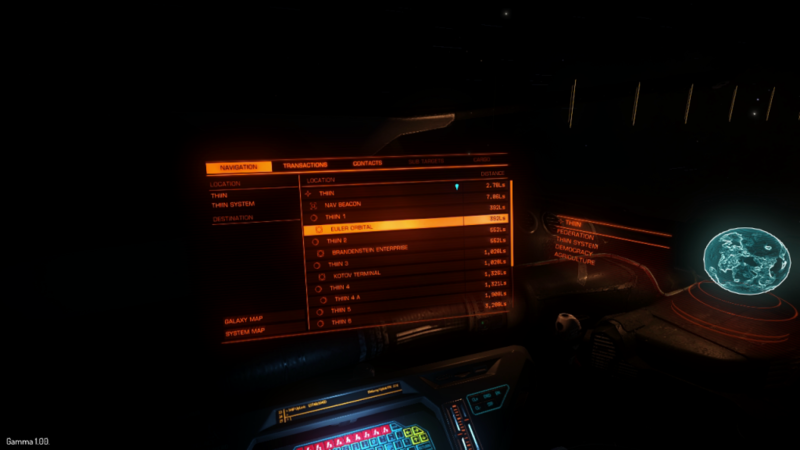 Well I'm now playing the Gamma version of Elite Dangerous. This is very close to what will be the released game next month. But rather than a review I thought it might be more interesting to do a play-through of sorts, and talk about different aspects of the game as they arise. I have put the pictures in spoilers simply to keep loading the page more convenient. 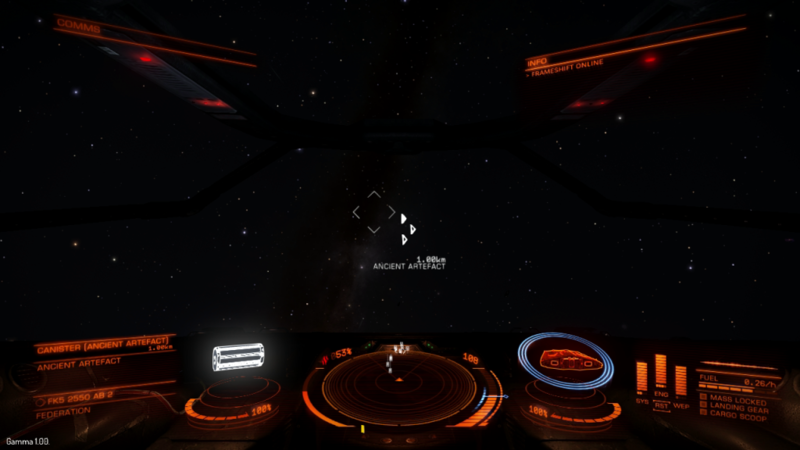 Before I started taking snaps I should point out that I did one courier mission and traveled from my initial starting system to a neighbouring one. But apart from that things as are they are when you start a new game. 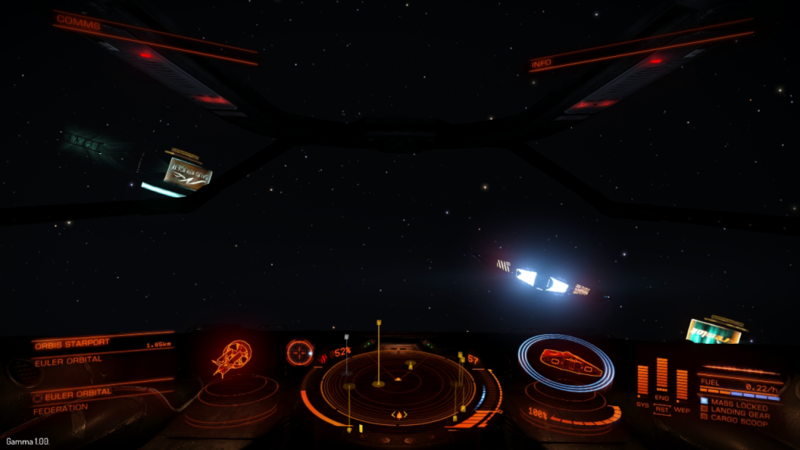 The first thing that happens is that you are randomly placed in a Federation sector in a Sidewinder- a small, limited one man craft. And you start the game with 100 credits. 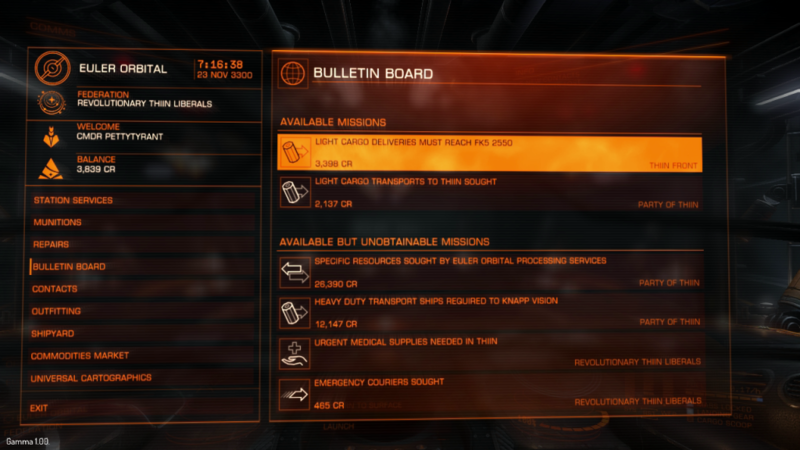 Which is about enough for 3 refuels and thats it. So basically you start broke and in a crap ship. 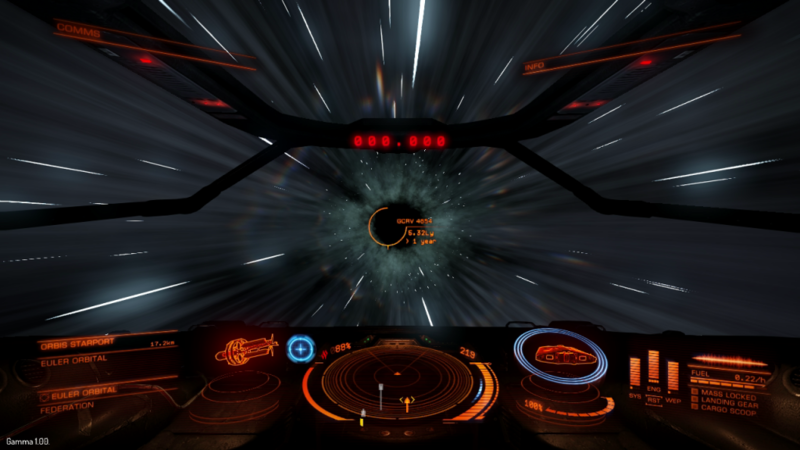 The first thing a new player is therefore likely to feel is slightly overwhelmed. 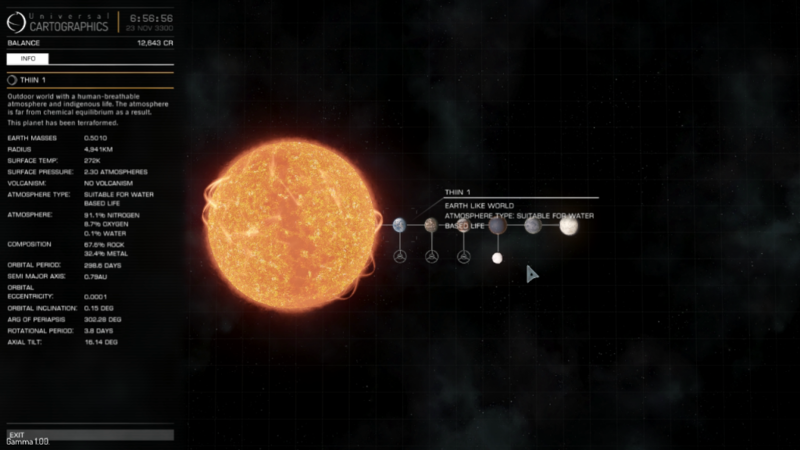 You are skint and alone in a game literally the size of the Milky Way. And the game doesn't tell you what to do. It points you in no particular direction, it gives no helpful hints. It's all entirely up to you. 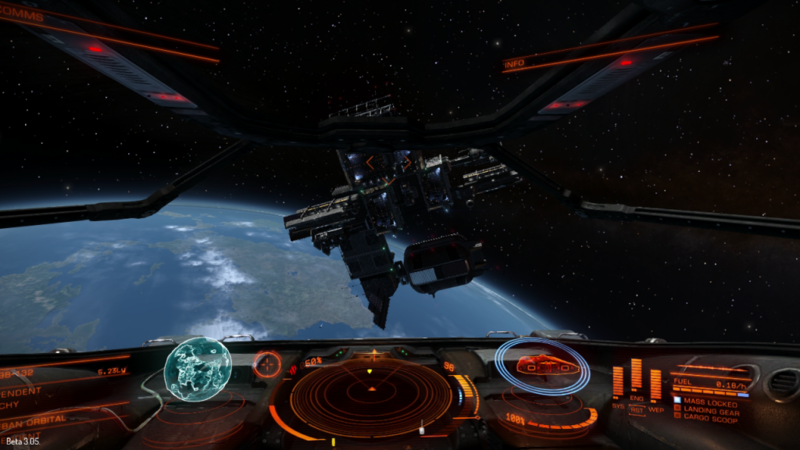 So in the spirit of adventure I decided just to see if could get my crappy little ship all the way to Earth in the Sol system. 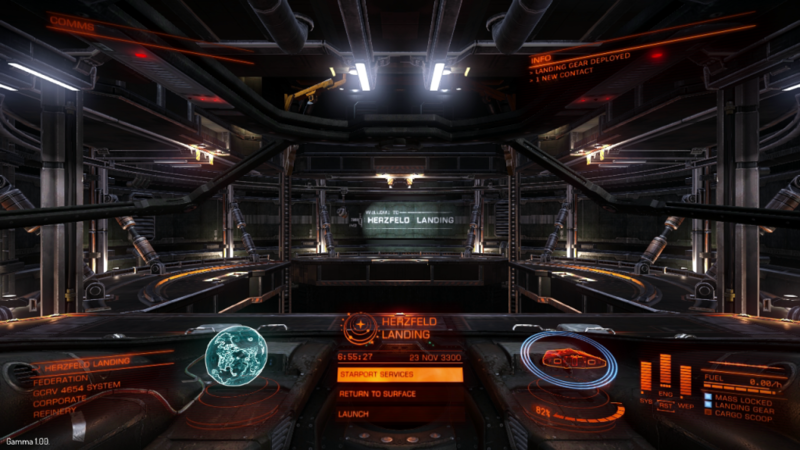 Currently I am docked at Herzfeld Landing. 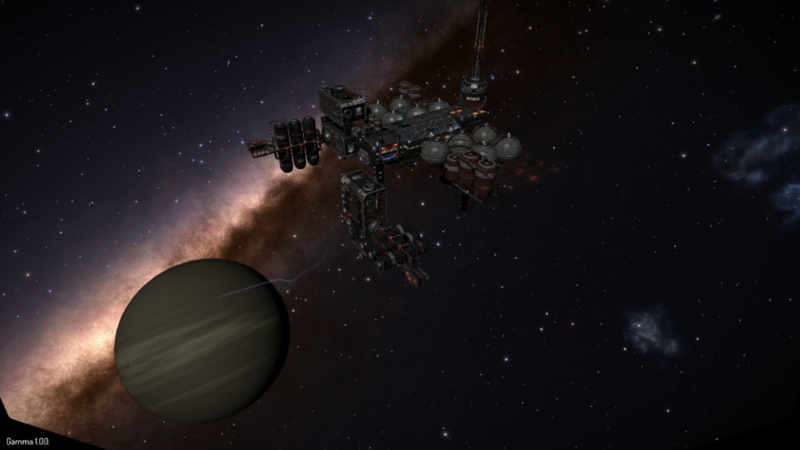 A small refueling and repair station. 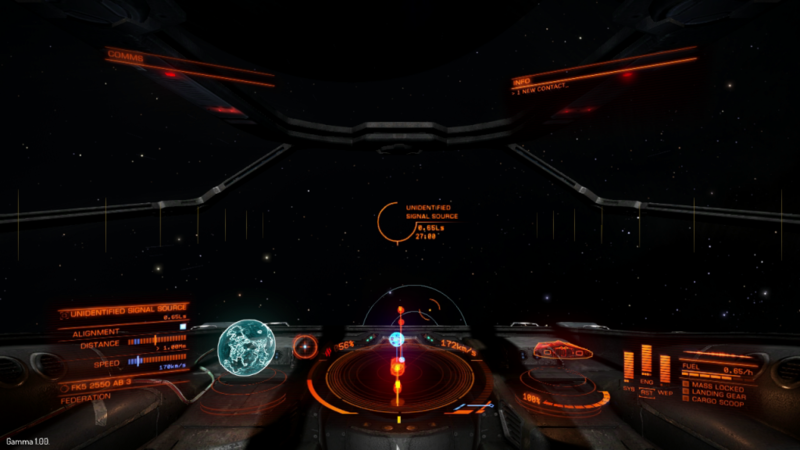 First a few word about the hud. Most of it is quite self explanatory. 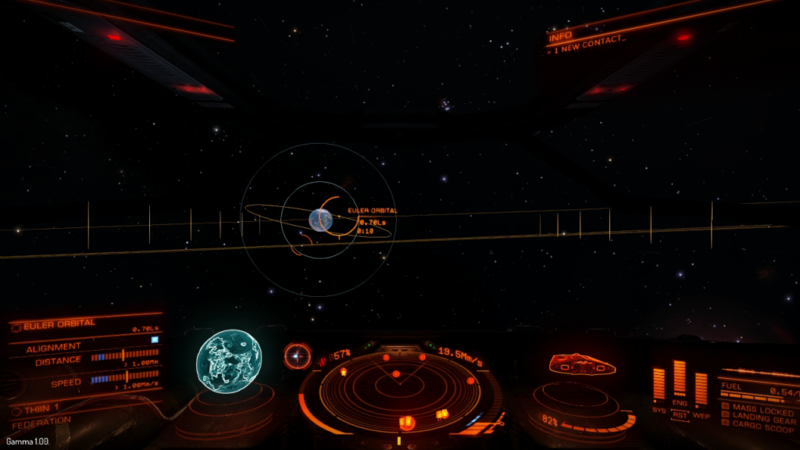 You have a radar in the middle (normally, when in stations its obscured by the station menu), to the left is a holographic display of either anything you have targeted or the largest nearest body in space if you dont have a target selected (in this case the planet around which the orbital station orbits). So first things first I need to plan where I am going next. 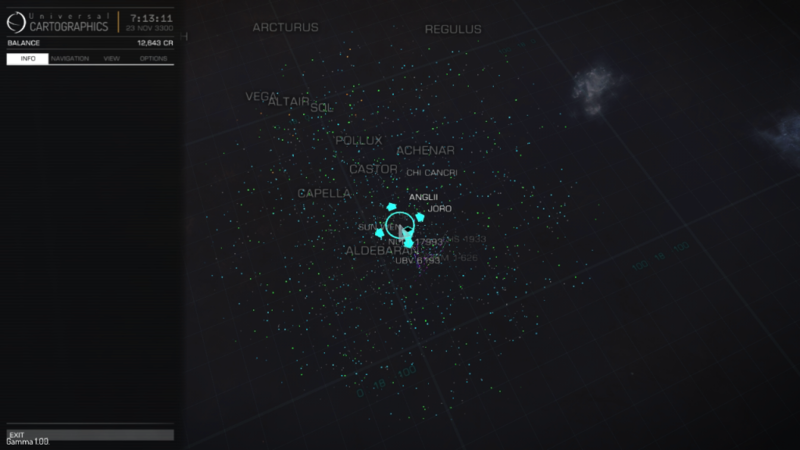 And that means going to the galaxy map. Where once more a sense of being overwhelmed can set in when the scale of things starts to sink in. 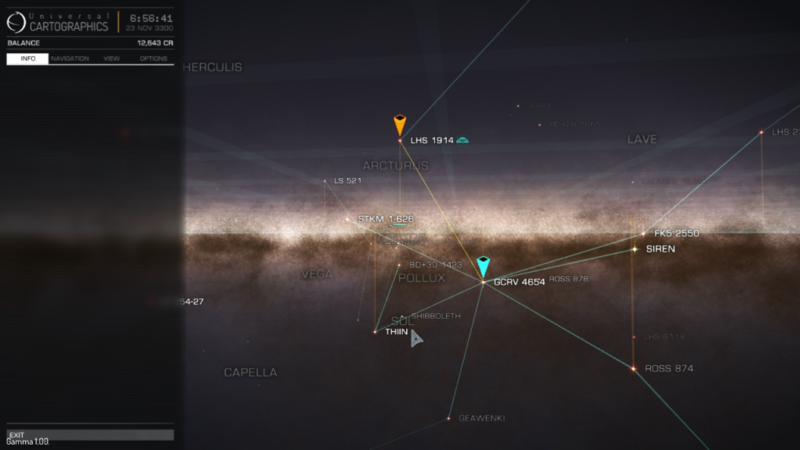 The blue ship icon is my current location. 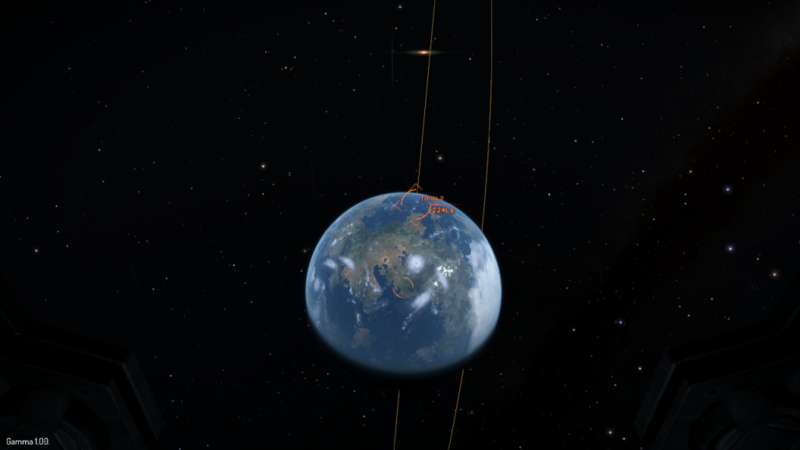 Sol is marked for convenience but trust me, its a very long way away. But that very long way away is just a tiny percent of the distances of the galaxy, so its all relative! 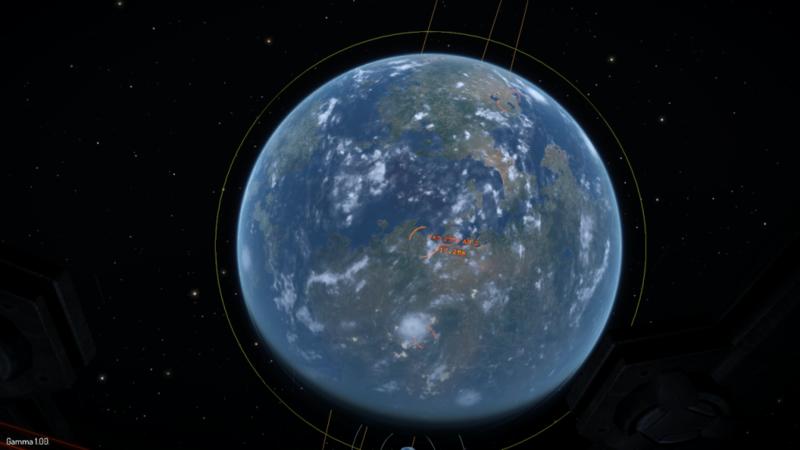 Thiin seems an option to fly to en-route, it has an earth like planet and an orbital station. So lets go there. Time to leave the Herzfeld Landing refueling station behind. 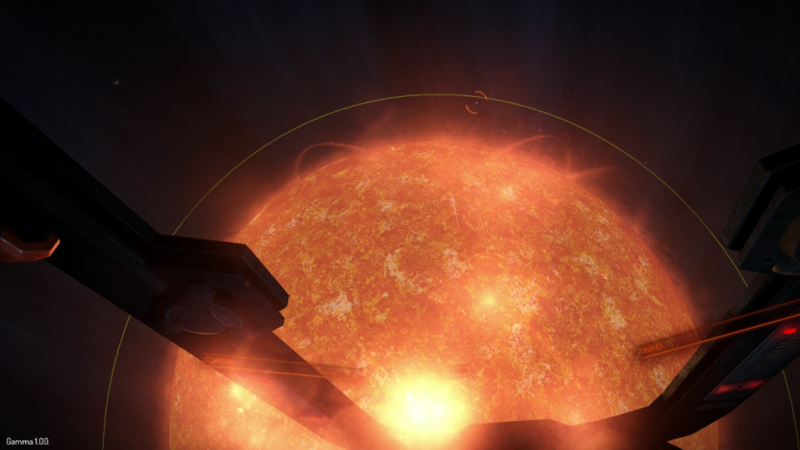 Jumps work by locking onto system stars, so you always come out close to a sun. 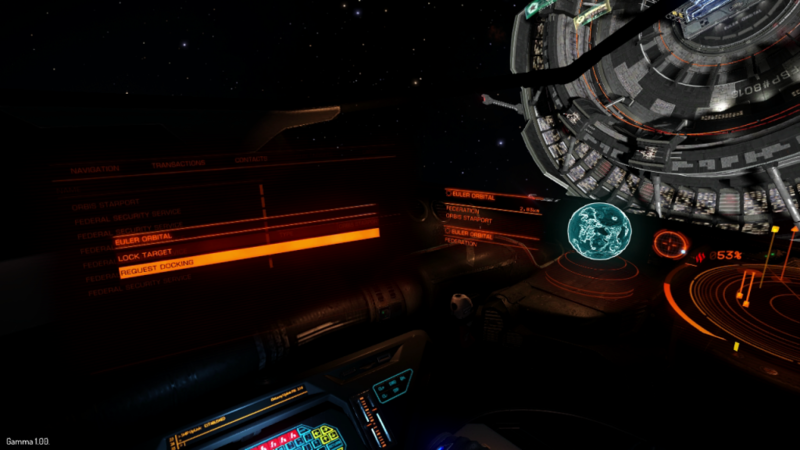 You can check your nav panel to see whats in the system and set a course. 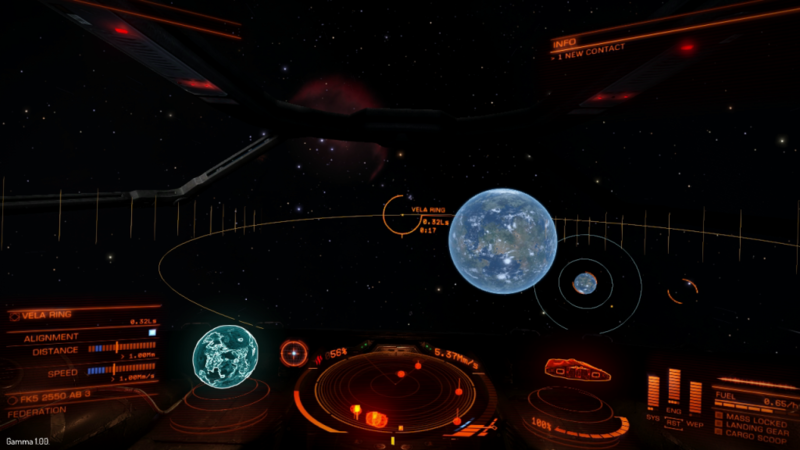 In this case I want to go to that earth like planet with the Euler orbital station. 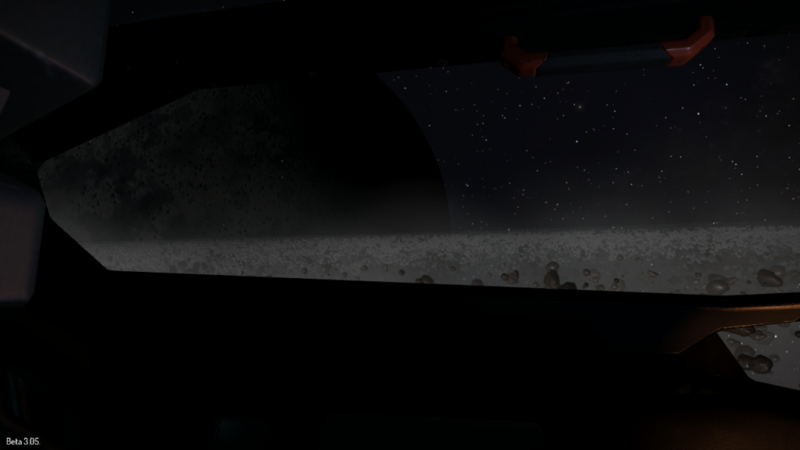 All these panels are part of your cockpit, and pop up when you look in their direction, so you never have to go to a bunch of menu screens, its all in game. 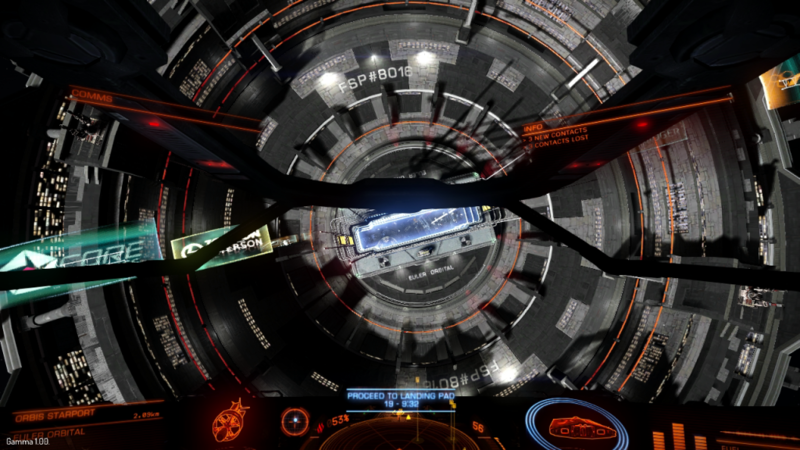 This really adds to the feeling you are pilotng a ship. 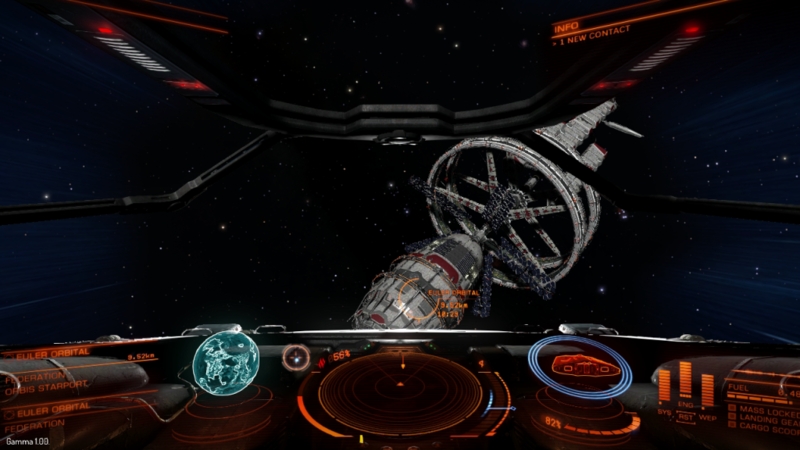 Time to talk a little about my ship. 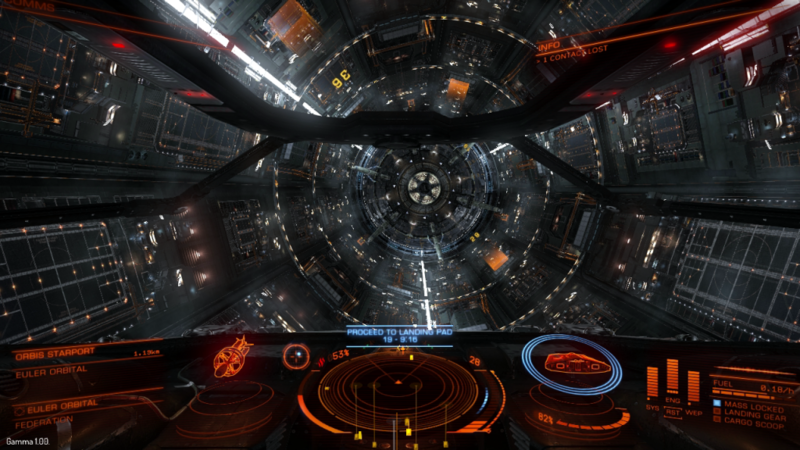 I will come back to this as I upgrade and improve things, a new ship being well out of my price range right now. 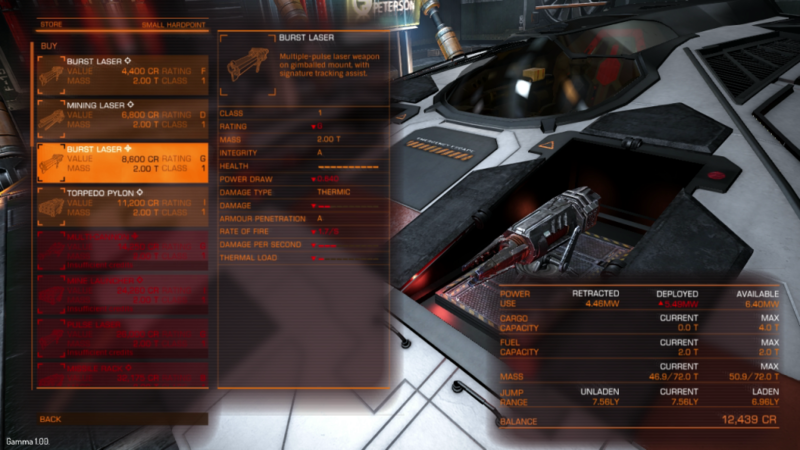 But I might still hit the odd bit of trouble with pirates or chancers, and currently my two basic main weapons are not ideal. Particularly I have found when playing with a joypad lining up fixed mounted weapons on a moving target can be a right bugger. So what I need are gimballed weapons that will help by tracking moving targets when lined up on one. Unfortunately I can only afford to buy one new weapon, leaving me stuck with the other one. It also cost me almost all the money I have, so I need to earn a living. For that you go to the Bulletin Board. 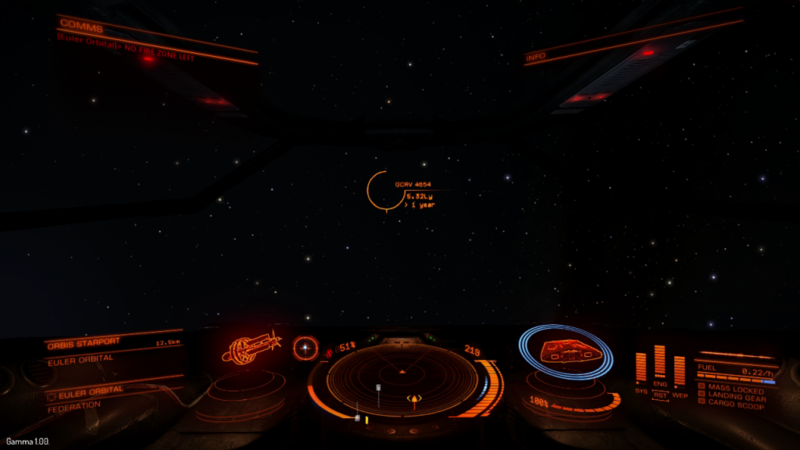 Unfortunately upon lining up with my destination I hit a slight snag- its over 9 light years away and my little ship only jumps 7! Failing to deliver goods incurs a fine and displeases whoever gave you the contract affecting your reputation and likelihood of decent future job offers, the cargo also gets marked down as stolen and you might find a bounty on your head, so this is a problem. 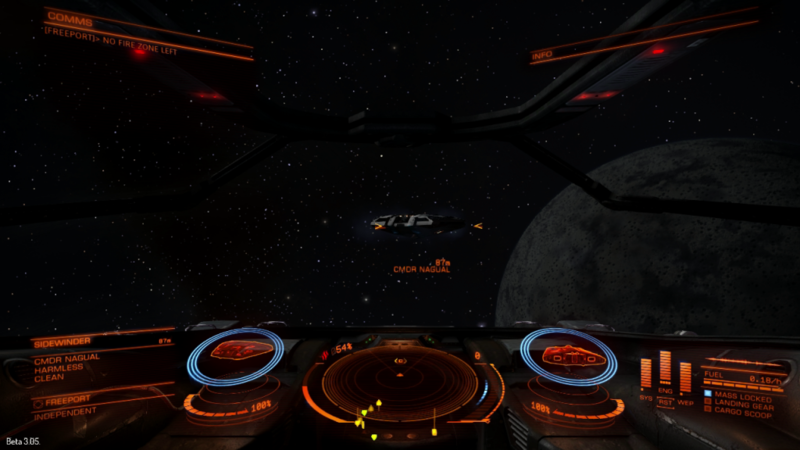 Before I even get there I get interdicted. 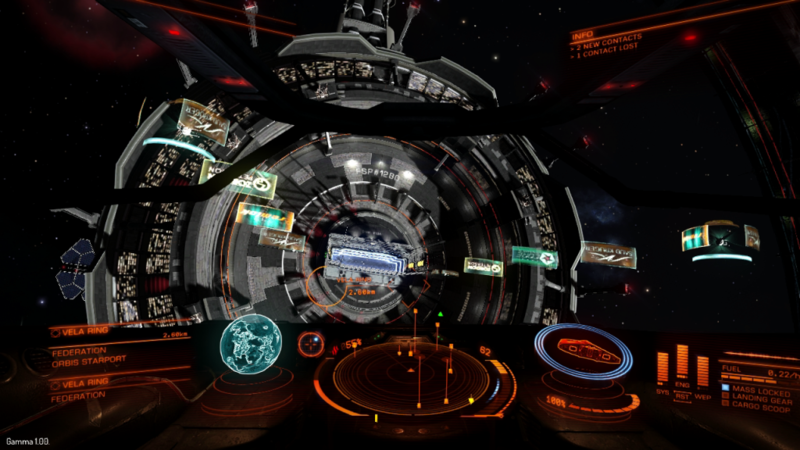 Indertictions are when someone tries to drag your ship out of supercruise back into normal space, sometimes its just a routine patrol to scan your ship for stolen goods or outstanding fines and warrants, sometimes its pirates. It takes the form of a sort of mini-game. You try to keep the escape vector lined up in your sights. 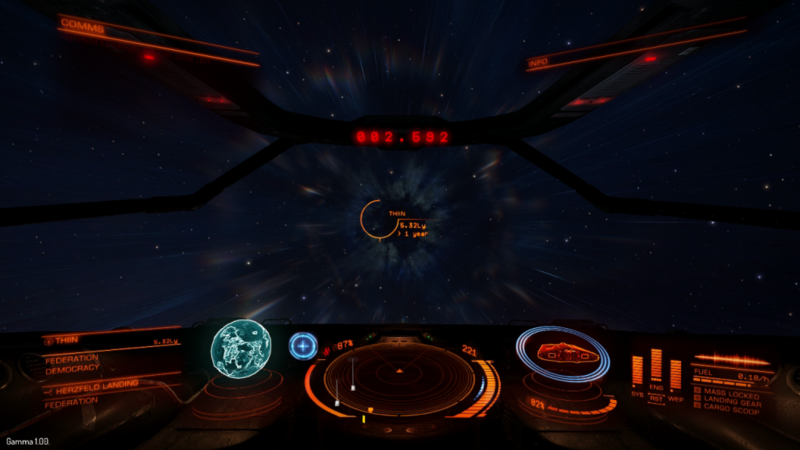 There are two bars on your hud, the blue which is yours, and the red which is whoever is trying to get you. Fill all the blue up by keeping the escape vector lined up and you escape, if all the red fills up they succeed and you will be dragged into normal space. 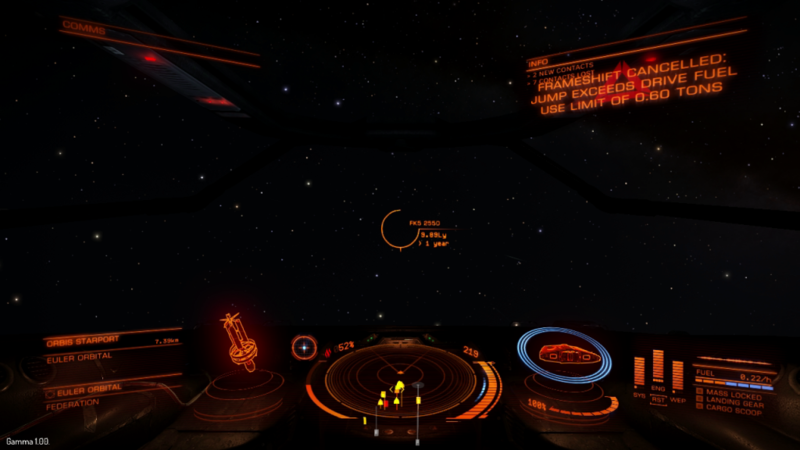 Luckily I managed to evade whoever it was and carry on my way to investigate the mystery signal. 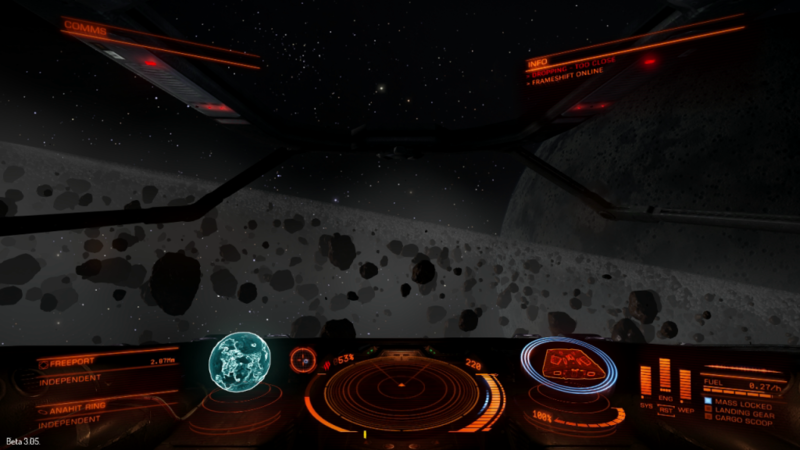 It turned out to be the intriguing sounding, 'ancient artifacts' left floating in space by who knows what- now these might be worth a bit of money, so I deploy my cargo scoop- only to release my hold is full of wine! 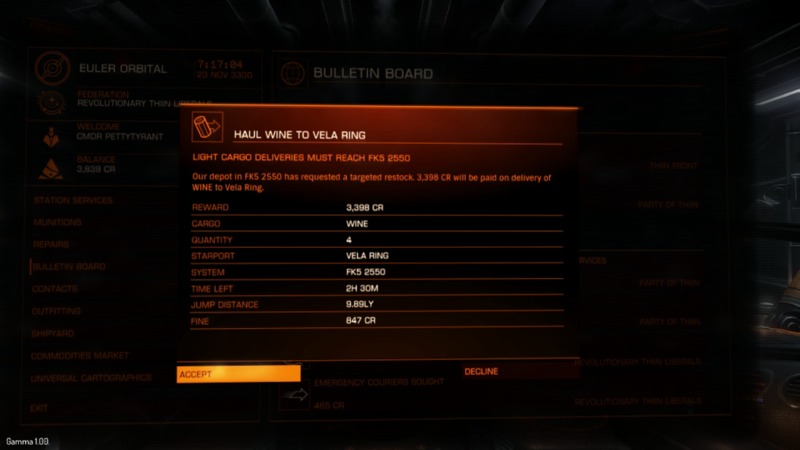 This is a bit of a dilemma- I don't know how much the artifacts might be worth, almost certainly more than wine, but are they worth more than the cargo of wine, plus a fine, plus loss of reputation? And I didn't even get to sample the wine! 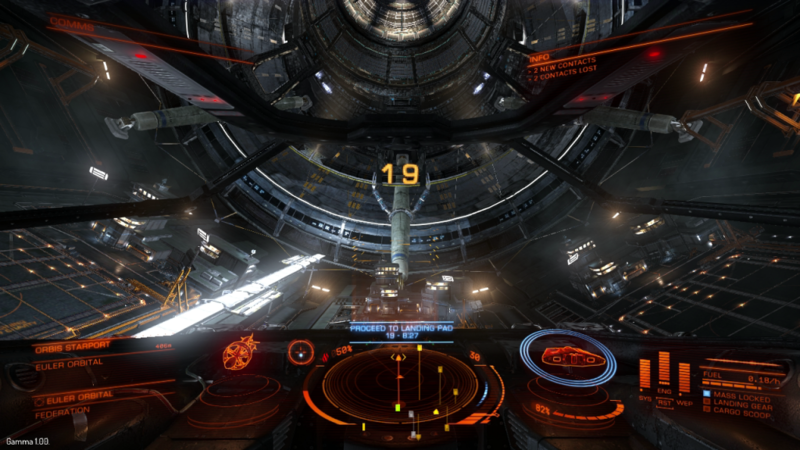 So time to refuel and rest up before planning the next stage of my attempt to reach Earth. 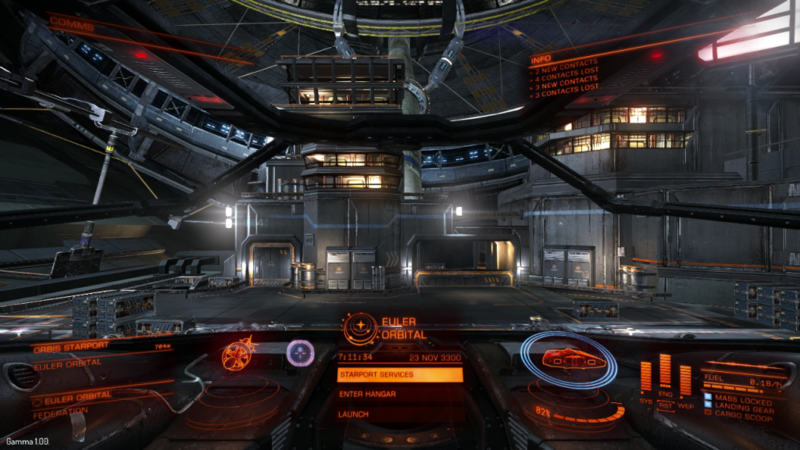 Elite should be right up your street Halfy- lots of science, lots of space, and you get to play with it all! 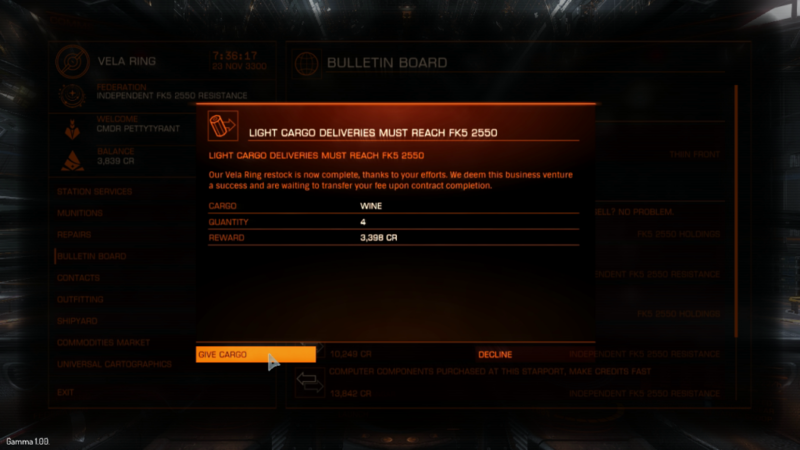 Aye, at only 5,000 credits per unit of cargo it wasn't worth losing a bit of Rep. It may have been by far far far far far more profitable, but we all know you to be a man of honour. Bravo, sir. Bravo.